Description: this bizarre slender reptilian creature assumes a walking posture. It sports a monochromatic paint job, basically being all beige. The underside of the figure (its belly, lower part of the tail, part of the lower jaw and throat) is coloured in a darker tone of beige (almost light brown or orange), which gradually shifts in the regular hue. A large number of red stripes run over its back, tail, flanks, neck and head. The inside of its huge mouth is all red including its tongue, while the figure has white teeth, including a total of six large teeth, almost fangs; two of these stick out of the upper jaw, four out of the front of the lower jaw. The Ornithosuchus has small white eyes with black pupils and carries a black JP logo on its right upper leg. The creature’s claws are not painted in a different colour. The inside parts of the dino damage area are bright red, while the pin sticking out is also beige. The Ornithosuchus is equipped with a thrashing action: moving the right hind leg makes the head spin round. Additionally, the beast’s lower jaw snaps back when pulled down and released, making it possible for this sculpt to clasp other figures between its jaws. Ornithosuchus also comes with dino damage: it features a removable tail section, revealing blood tissue and a pin (resembling a bone) sticking out, on which the tail can be pinned back. The figure also comes with two pieces of capture gear, a small chain to restrain the limbs (though only two of them at the same time, not all four), as well as a large muzzle to keep the creature from biting. It doesn’t stop the beastie from thrashing its head though. Both pieces sport a shiny metallic grey paint job. Analysis: another cool non-dinosaur figure from a past toy line returns for JP: Dinosaurs 1. Despite it not actually being a dinosaur, Ornithosuchus adds some wonderful variety to the line, while also giving people who missed it the first time round another chance to get a hold of this rather rare and quite sought after figure. The Ornithosuchus sculpt has not been changed and remains as cool as before, with a great but violent take on the classic dino damage feature and a funky head move which doesn't look like a serious attack option unless it has some prey firmly ensnared between its powerful jaws. It comes with the same capture gear as before, though with the more common silvery grey paint style. So, as with most other JP: Dinosaurs figures, the only new thing in this set is the paint job. It's simple to say the least. It's largely a single colour, except for the red stripes, which fit the creature well, as if it's soaked in blood stripes after gnashing its way through a carcass much bigger than itself. It also has a sort of camouflage quality to it, like a tiger hiding in long grass. This new colouration might not be as appealing as the more colourful previous paint job, but it still works. However, the stripes are applied in much the same way as on its predecessor, so it scores little originality wise since it's basically the same paint scheme (which is not a first for JPD1 of course). And as is common in this toy line, some details are overlooked, like the claws. Also, white is just not a decent colour for prehistoric eyes. But overall, this is not a bad paint job despite its simplicity. Repaint: yes. This is a repaint of the original TLWS2 Ornithosuchus, including that figure's capture gear repainted in a more standard colouring. The figure would not be repainted again. 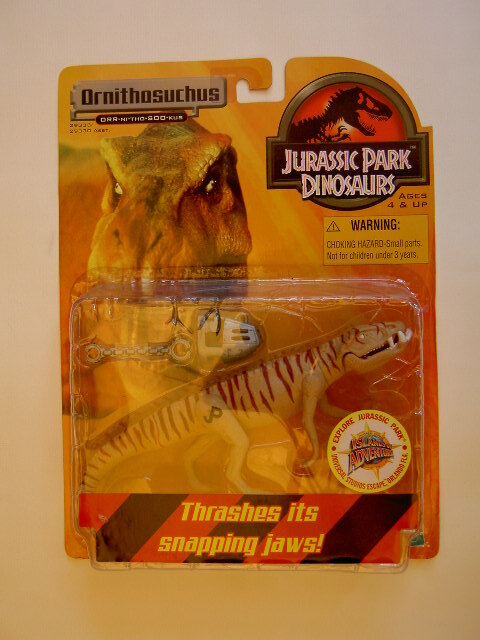 Interestingly enough, a second Ornithosuchus repaint was originally planned for release for this line along with a Roland Tembo repaint, but it didn't happen, though small quantities of packaged samples have popped up, indicating it got at least passed the prototype stage. Overall rating: 8/10. A minimalistic but surprisingly effective paint job, though not significantly special either: like most other JP: Dinosaurs figures, it could have used some more work. The figure itself is as good a sculpt as ever. Despite this figure being a Wave 1 release, it is definitely harder to find than some other JP: Dinosaurs figures for some reason (one thing that comes to mind is general Ornithosuchus popularity), but it's worth a try, especially if you don't own the previous incarnation of this sculpt (which is still the rarer and cooler figure of the two).